Xherdan Shaqiri looks set to sign for Liverpool and will likely be a Red before next week, when his new team-mates fly out to USA for more pre-season friendlies. This is according to trusted reports everywhere, including BBC Sport. But as is the way nowadays, fans have found some social media activity from current Liverpool midfielder Marko Grujic that’s slightly controversial – and directly relates to the potential new arrival. 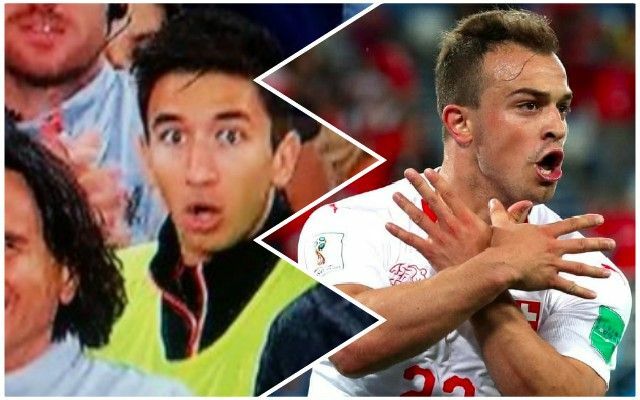 Grujic liked a post referring to Shaqiri as ‘not a good person,’ following the 26-year-old’s decision to celebrate his World Cup goal v Serbia with the ‘Albanian Eagle’ – a political reference to Baltic conflict between Serbia, Albania and Kosovo – which has been independent since 2008. Serbia doesn’t recognise Kosovo’s independence, but Shaqiri, born there despite representing Switzerland after emigrating in 1992, does – and like many who were affected by Serbian atrocities in the 1990s – hasn’t forgotten. It’s not for us to pick a side, and to be fair, we imagine both will act like professionals and this will not be an issue should Shaqiri sign this week. Anyway, Grujic is almost certain to leave on loan.